Let’s face it, working outside of the home while pregnant can present a range of issues from additional physical discomfort to unneeded stress and strain. During my last two pregnancies, I was working full time while balancing the demands of pregnancy and little ones at home. The stress of going to work was overwhelming, and I would often find myself fantasizing about how relieving it would feel to work-from-home. Thankfully there are a plethora of work-at-home job opportunities now available that allow pregnant women to work (did I mention in sweatpants?) from the comfort of their own homes! 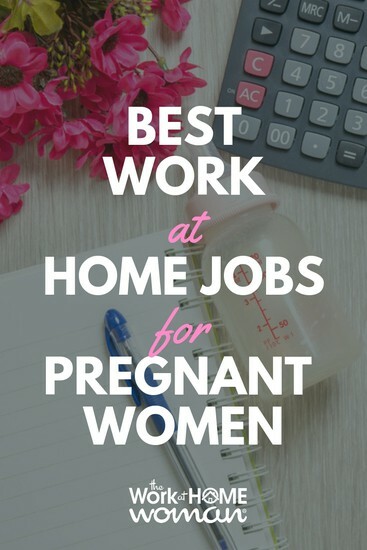 Whether you’re transitioning out of your nine-to-five in preparation for your maternity leave or you’re simply looking to increase your income before adding a new bundle to your home, you’ve come to the right place for finding the best work-at-home jobs for pregnant women. Before diving into our list of jobs below, we thought we would share a few tools so you’re fully prepared for your new journey. Now that you’re pregnant you may find your tolerance level for uncomfortable situations is slowly dwindling. Knowing your own tolerance levels and prepping ahead of time will ensure that your surroundings are properly staged for work-at-home success while pregnant. Below are a few of my personal favorite go-to items that are certain to help create a comfortable work environment while you're pregnant. Water, water, and MORE water—hydration was supposed to be my BFF… make sure it’s yours! Having just a few of the above items ready to go will help you to manage your time, (no getting up and down for water, snacks, etc. ), and keep you focused on your jobs at hand. Now that you’re prepped, you’re ready to dive into that work-from-home journey. Looking for a work-at-home position with phenomenal flexibility? Blogging is one of the most flexible work-at-home positions for any pregnant mama! Whether you choose to work for a company writing weekly posts or decide to create blog posts for your own website, there are a few ways you can earn a significant income by blogging from home. Below we outline how you can get started with blogging. If you’re thinking about starting a blog, you should begin by reflecting on what you’re most passionate about. Do you love crafting? Perhaps you have a flair for fashion or a passion for personal finance? Whatever your focus might be, think about how you might develop it into a blog that would ultimately help others. Another great benefit of building your blog while pregnant? Monetizing it! As you build your blog’s audience and list of subscribers, you can begin to make money through affiliate marketing. You can also step up your monetization game by creating opportunities to generate passive income. Creating products such as eBooks and courses are a great way to earn income during those first few hazy days of newborn bliss. Starting a blog is an exciting way to earn money from home, but it requires some time and research. Thankfully we’ve got you covered on all of that too. Check out our resources on starting a blog, and let us know if you have questions along the way! Perhaps you want to get your “blogging feet wet” before diving into writing your own blog; this is the path I chose. If this is the case, you can start by writing content for businesses. The flexibility is still there, and with a large number of companies seeking blog writers, you’re more likely than not to find blog topics in which you’re interested. Depending on where you are within your pregnancy, your day-to-day schedule, and the need to make income, you might also be able to balance your blog while writing posts for other companies. Metro Parent: Is seeking experienced freelance writers to create content on parenting. Pay varies depending on the type of post you write, its complexity, and sources you used to create a compelling piece. ProBlogger: Freelance job board for writers. Pay is generally by contract. Upwork: A job board that includes a variety of freelance opportunities including blogging and writing jobs. Pay is dependent upon the client but is typically per project. Upwork charges a small percentage per accepted project. Freelancer: An online marketplace that allows freelancers (writers and more) to bid on incoming projects. Fiverr: An online marketplace where freelancers can post writing gigs for potential clients to bid on or buy. This is another flexible work-at-home position for all of you expectant mamas out there. Depending on whether you start your own VA business and scale it or you decide to work part-time for one company, there’s a ton of room to grow in this industry. This work-at-home job is perfect for pregnant women. It gives you control over how many clients you take on all while allowing you the flexibility for unlimited snack and bathroom breaks! The other bonus with this growing field is that you can decide what area of virtual assisting on which you’d like to focus. From being a Pinterest or social media VA, or being an administrative VA (think managing appointments, customer service calls, and emails), there are several possibilities out there for you to investigate. Or any one of the online marketplaces mentioned above to see what’s available. Testing websites is a fantastic opportunity for those pregnant mamas out there looking to add a little extra cash to their day. Usability testing allows you to test websites, apps, and user interfaces (the design and processes of how you interact with a program) so that businesses can provide an exceptional user experience for their customers. Perfect for those days that you’re packed with doctor’s appointments and staging your nursery, website testing can fit into any busy pregnant woman’s schedule. With several website testing opportunities available, you can also choose multiple sites per day to make more of an impact on your wallet. UserTesting: Complete tasks by speaking your thoughts out loud. You can earn up to $60 per test. Respondent: This website has a little bit of everything – from surveys to focus groups and, of course, website testing. Fill in a series of questions, register, and then you’re off and running. You will need to log in to check the status of any pending projects for which you applied. Pricing varies depending on the project posted. Userbrain: Each project takes about 5 to 15 minutes and is as easy as speaking your thoughts about your experience. You earn $3 per test and payments are made weekly. Userfeel: Register for an account, take a sample test and, after approval, you’ll be able to get paid to submit your thoughts regarding your experience on certain sites. You can earn $10 per test. Userlytics: You can interact on this platform with either your mobile device or computer! Provide feedback for websites, prototypes, applications, and more. Register for an account, test out a site and get paid via PayPal. Payouts range $5-$20 or more. Love to teach but don’t like the commute or the four walls of a classroom? Online teaching has made a massive impact in the field of education, and it continues to grow. Whether you’d like to teach collegiate-level courses or engage English Language Learners from abroad, there is a range of options for pregnant women seeking to make a positive impact through teaching. Indeed: Using job boards such as Indeed, you can find a variety of collegiate-level job opportunities online that range in both content and pay scale. A transcription job may be the perfect job for pregnant women! This job requires very little except maybe a comfy chair and a quiet workspace. You must be comfortable working at a computer and should have a quick and accurate typing speed (most sites give a quick test to check in on speed and accuracy of prospective employees). Rev This is one of the more popular closed captioning sites. Positions on Rev include transcriptionist, captioner, subtitle, and translator positions. TransPerfect Aside from the great captioner position available, this company just looks like a fun place to work. They embrace the idea of mixing business with pleasure, and the overall company culture seems warm and inviting. Captionmax This company hires real-time and offline captioners. Positions are always changing, so be sure to check in often! To apply as a captioner with Captionmax, you will need some experience (typically 1-2 years). If you’re still looking for additional information on transcription jobs and careers, check out our post here. I have a close friend who’s constantly asked by her husband to edit or proofread for him. From texts to emails and everything in between, she’s the go-to proofreader for her family, and she couldn’t be happier! If you find pure joy over the proper use of commas, spelling, prepositional phrases and every other aspect of English grammar, working from home as an editor or proofreader is the way to go. This work-at-home job is perfect for expecting mamas because of its flexibility and brevity of each project (most proofreading and editing assignments are brief in nature, but you do have the option of finding more long-term work). The only time constraint here are the deadlines set by your clients (which is similar to blogging). Be mindful of how many clients you take on and ensure that the work is completed promptly. Aside from deadlines, becoming an editor or proofreader offers the type of flexibility most pregnant mamas need! Do you love all things Twitter, Facebook or anything that involves networking with people? Becoming a social media moderator may be the best work-at-home job opportunity for you! My own Pinterest VA business idea was rooted out of my slight obsession with the platform (I was on Pinterest more than ANYTHING else when my kiddos were in bed). After seeing how much time I was actually spending on the platform, I decided it would be a great opportunity for me to build a business from it and you can do the same as a social media moderator! Social media is now a MAJOR marketing component for most businesses, and because companies understand the value of being consistently active on social media, they’re hiring help! Social media moderators manage Facebook pages, posts, tweets, and much more on a daily basis. This work-from-home job is also perfect for all of you expectant mamas out there because it generally provides a steady source of income (you can set up a contract with your client for a fixed monthly price) and it’s something you can easily keep up with once baby arrives! Win-Win! Every pregnancy, family, and financial situation is different. If you’re looking for a work-at-home position that allows greater flexibility with deadlines and more mobility during your pregnancy, then a blogging or virtual assistant job may be one of the best options for you! If you have an open schedule during the day and would rather have a set number of hours to work, then online teaching or tutoring might be the avenue to check out. Finding a remarkably flexible work-at-home job while balancing pregnancy is no longer just for dreamers. 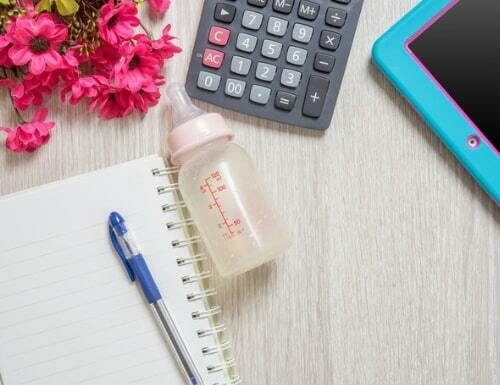 With many types of work-at-home jobs available, you’re sure to find one that suits your pregnancy, family, and lifestyle – right up until your little one arrives! Are you a pregnant mama just starting your work-at-home adventure? Do you already have experience working from home? Leave us any questions you might have or share your experiences with working from home while expecting! We would love to hear from you! This page includes affiliate links. Please be aware that we only promote advertising from companies that we feel we can legitimately recommend to our readers. Please see our disclosure policy for further information. I want to learn anything and everything that would allow me to work from home. I will not do survey jobs. But I am open to other options. Legit jobs. No lying jobs. I don’t have the money to start a business. Hello, Hayley! I totally get it! When I first started looking for a work at home job I was completely overwhelmed. So many options…how could I choose which ones to apply to? Thankfully, not too long into my search, I found Holly and The Work at Home Woman. About a week and a half later–I landed my first gig! Yay! I will say that I was a bit advantageous in applying to jobs! Everyone’s experience will be different but you’ve started in the right place!